Colour: Amber with gold reflection. Nose: Clean with toasted and spicy notes. Apple and apricot fragrance. Very fresh. Palate: Rounded and vanilly flavour combined with a perfect balance between oaky and fruity notes. Finish: Long lasting finish revealing remarkable fruity, oaky and floral notes. Located 50 kilometres west of Sapporo on the island of Hokkaido, the Yoichi distillery cannot go unnoticed with its stone walls and red tile roof. It combines tradition with an aesthetic that only the Japanese can achieve. It has an underground water source that is filtered through peat; the best water there is for whisky production. It has its own kiln topped with traditional pagoda-shaped chimneys. The kiln was decommissioned at the beginning of the 1970s. However, its pot stills are still heated by naked flame, a traditional method that has been abandoned by most of the Scottish distilleries. They are squat and onion-shaped, and produce a rich, full-bodied alcohol. 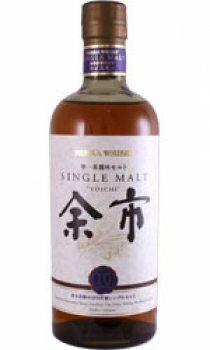 The Yoichi distillery is located just one kilometre from the sea. Its geographical location contributes to the complex character of this whisky, with its salty and slightly medicinal notes. Yoichi possesses its own cooperage, and is particularly careful when selecting its barrels. Known as Hogshead, the barrels are made on-site using new oak, a practice that is becoming rarer and rarer in Scotland.